This week, two analysts from UBS gave us the most shocking headline which said 75,000 stores will need to close by 2026. They argue that if online continues to steal market share, there simply won’t be the need for so many stores. I’m sure if I said by 2026 five million users per year will abandon online shopping due to privacy hacks and data leaks, I too could grab headlines. 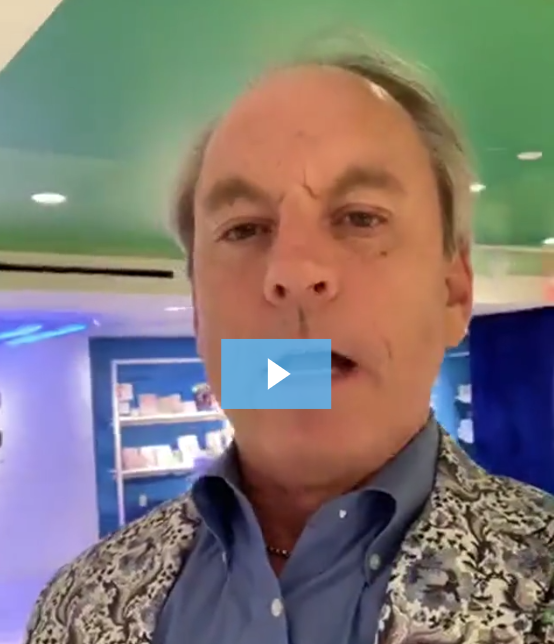 To get to the answer of how retailers are trying to hold onto and grow their market share, I embarked on a visit to three of New York’s top destinations to discover what’s new in retail. I went to Hudson Yards, the 25 billion mixed use development on the west side of Manhattan, the new STORY concept at Macy’s Herald Square, and the flagship Saks Fifth Avenue across from Rockefeller Center. I dare you to come up with a mix of more beautiful stores in a mall that doesn’t feel well, mall-like. Instead of a big cavernous structure, you encounter smaller groups of stores as you navigate the large spaces. What I liked were the tall ceilings that gave the hallways and stores a feeling of spaciousness. The big tourist attraction is outside in the courtyard facing the Hudson River. 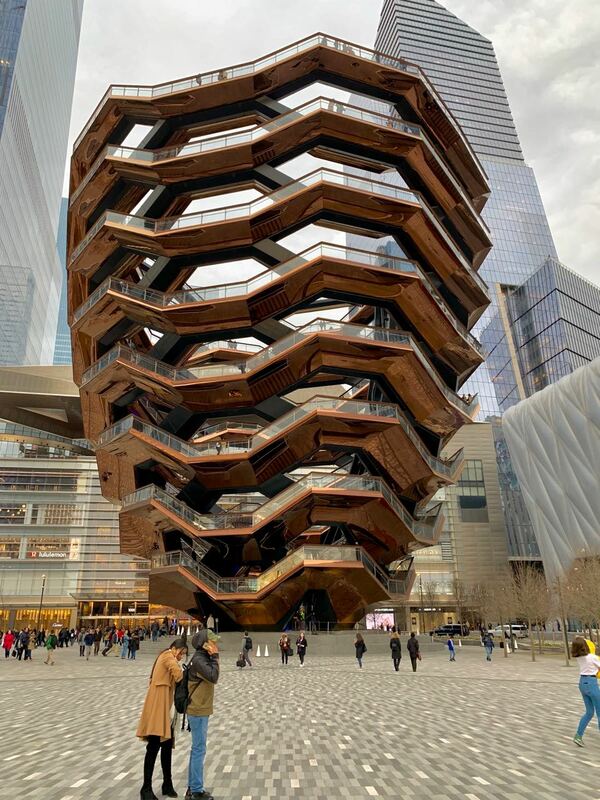 The Vessel, a 150-foot-tall copper-colored architectural object with interconnecting stairways. In person it is quite stunning. 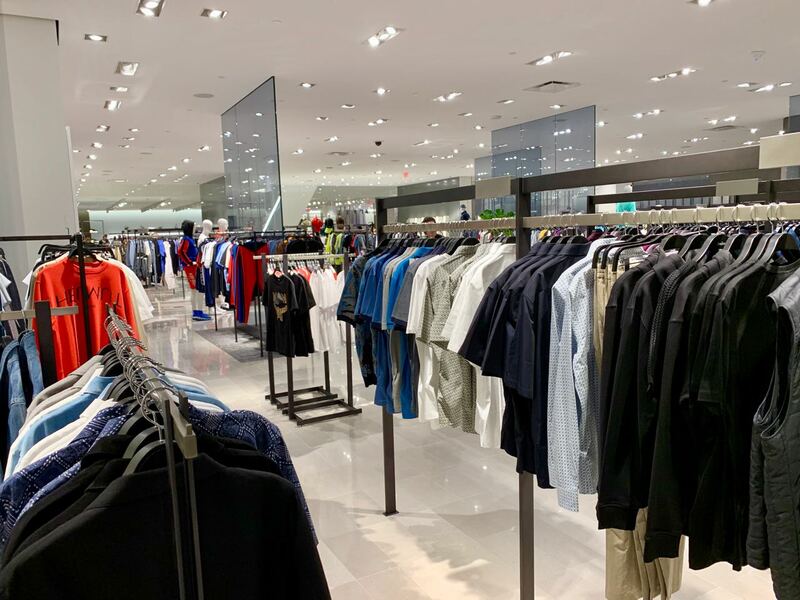 As I went into a number of men’s stores at Hudson Yards, nothing. No greeting. No eye contact. One guy brilliantly called to me from behind me, “You look like our customer.” I answered, “I think I am,” as I picked up a yellow-striped shirt wondering if I could pull it off. I expected him to come over to talk to me face to face or acknowledge we were two humans trying to communicate but instead, he turned back to some other guy in the store. #missedit. At Neiman Marcus, I stood in front of the mirrors, held up several shirts to consider and then one by one put each shirt back. Silence. In all fairness, they were having some kind of event and the men’s floor was packed with servers passing out champagne and hors-d'oeuvres to mostly young women. Again, almost all the attendees were women… in the men’s department. 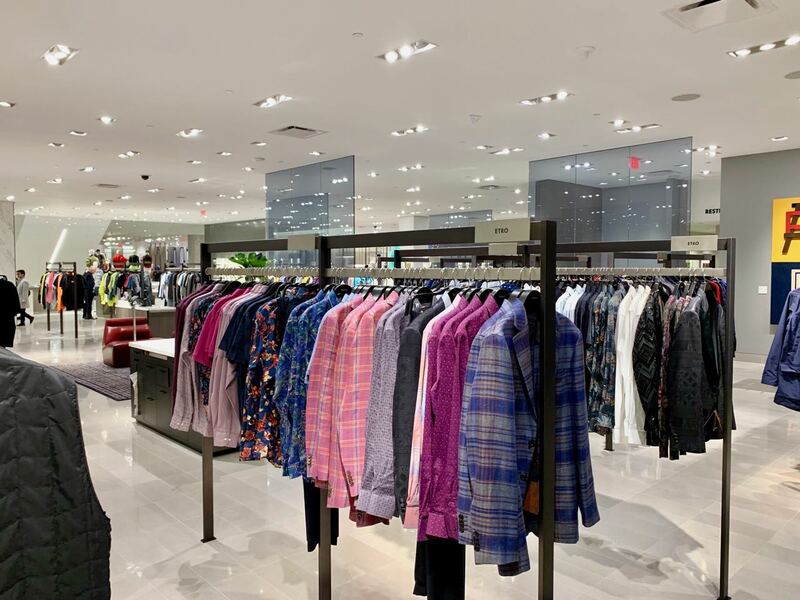 Neiman’s had games intermixed throughout the menswear to break up the merchandise and add a touch of whimsy, a way for consumers to be surprised and even try out a classic ball toss game. But where was the detail of whimsy and engagement from their employees? Nowhere and it isn’t just Neiman’s at Hudson Yards. I saw the lack of engagement in the newest most forward-looking stores there as well; just like I see it in far more mundane retail stores across the world. Look, I'm brick and mortar's biggest champion - and while I may call out many retailers - I am often their customer. Make no mistake - I want them all to succeed! The robots are already here. They are the employees with their hands placed behind their butts with vacant eyes looking out into the mall or some far off place, waiting. Waiting. Blinking. Their hard drives in sleep mode..
Coresight Research recently reported that luxury retailer inventory levels increased due to planned investments in store expansion and assortment mix optimization. When it comes to Neiman's merchandising, with the exception of the grouping of a few mannequins, they merchandise all of their menswear on poles at eye level. Their merchandise is all crammed together; it all looks the same. Nothing visually breaks up the different designers. It’s like looking in someone’s enormous closet. Missing are the half-mannequins or four-ways or anything that could have featured one outstanding look from each designer. Rachel Schechtman, Macy’s brand experience officer, launched 36 STORY store-within-a-store concept shops in 15 states this week. STORY has sections delineated by color with faux fur on the columns and fixtures that all matched. Within those departments were some 400 curated products from local, national, and international brands such as Crayola, Levi’s and MAC Cosmetics. 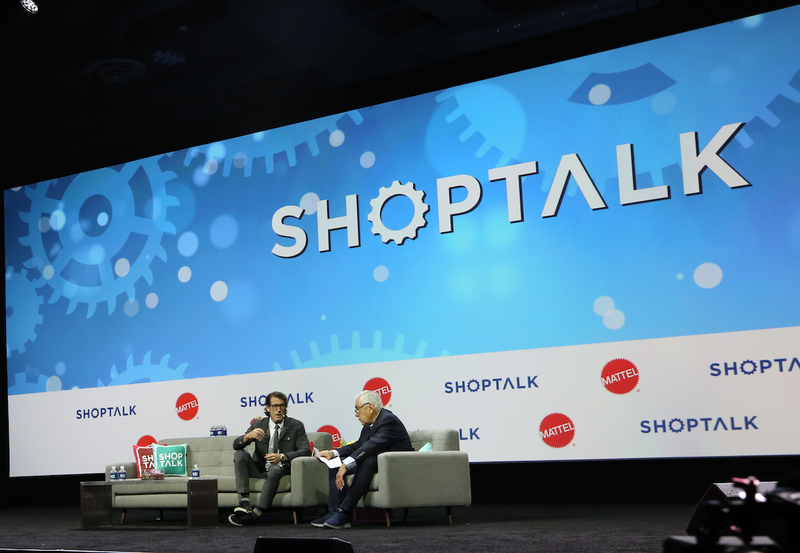 Schechtman said STORY hired more than 270 managers as well as STORYtellers to participate in Macy’s new “Know + Tell” experiential training program to prepare for the launch of the concept. Despite all the written signs that explained the story of each section and the employees stuck in each, STORY looked like a hodgepodge of small things that didn’t seem easy to distinguish, especially since all were grouped by a single color. Yes they had interactive elements like a wall like the old light brite and places to draw but many people just walked on. While it is a curated selection, this new trend of putting a lot of small products out and expecting shoppers to want to spend time examining them all just feels like work. My experience at those stores left me unprepared for the visual joy of walking into Saks and seeing the striking iridescent dichroic glass escalator. 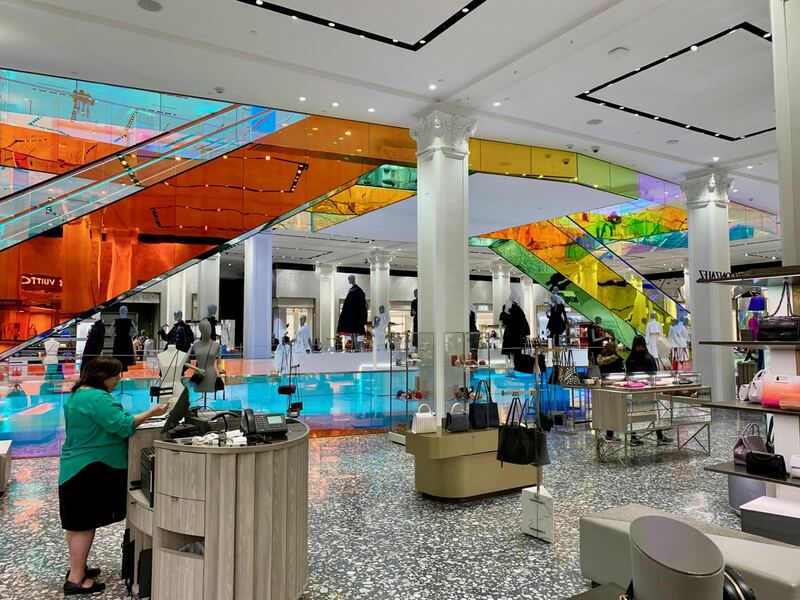 Saks had punched a hole in the middle of the second floor to accommodate brand new escalators surrounded by the amazing artwork designed by Dutch architectural firm OMG. A truly amazing detail worth every penny. Their new traffic patterns are inventive and engaging in the men’s area. 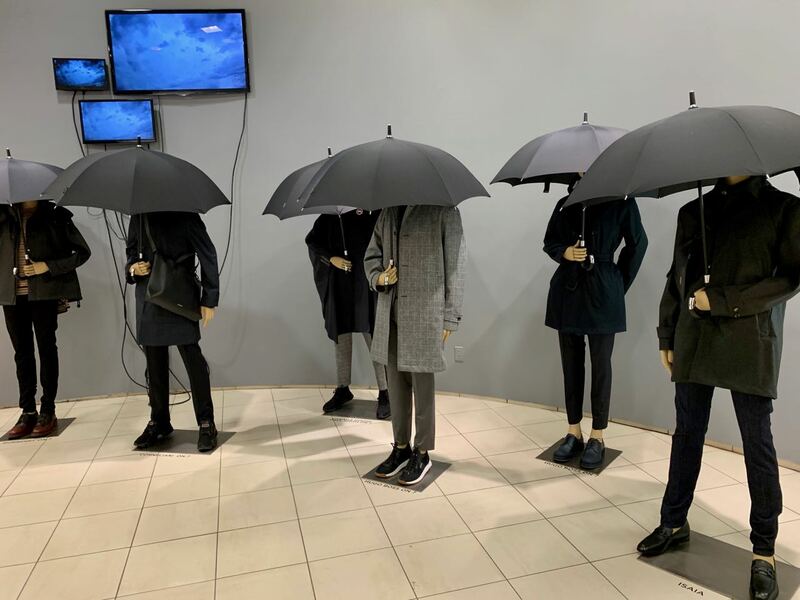 Their merchandising is top notch and created with great thought at displaying the merchandise in ways to take notice like this display of raincoats and umbrellas with storm clouds on monitors. One young well-dressed salesman engaged me about the jacket I was wearing saying it was amazing and asking where I got it. I told him, “From you.” “Really?” He asked as he came closer, “What is the brand?” I told him and we had several minutes of conversation before I moved on; he engaged me and we connected. That’s the basis of building a sale. Saks got attention because of the escalator, but something is different at Saks in a good way. I noticed it in Palm Desert a couple weeks ago when I originally bought the jacket. Employees are trying to connect. And good for them. I’ll be back. You have to go further than building monuments to commerce and build moments of engagement if you ever want to get margins. And you have to get the curious shopper to actually buy the merchandise. Otherwise you end up with a marble building, a neon-colored mezzanine, and kidding yourself you’re doing everything you can to get the merchandise out the door when structurally, you do not have a branded shopping experience. 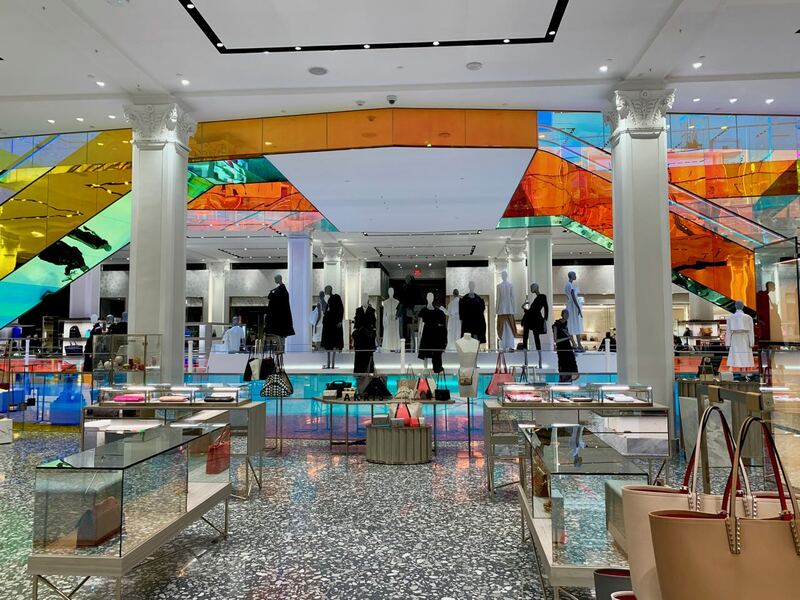 You can engineer an amazing art piece like the Vessel at Hudson Yards; you can engineer covering the columns at Macy’s with faux fur in a myriad of colors, but until you engineer a branded shopping experience, you’ve failed design 101 – it’s about converting a looker to a customer. Miss that, and the design isn’t worth the pixels it’s drawn on. 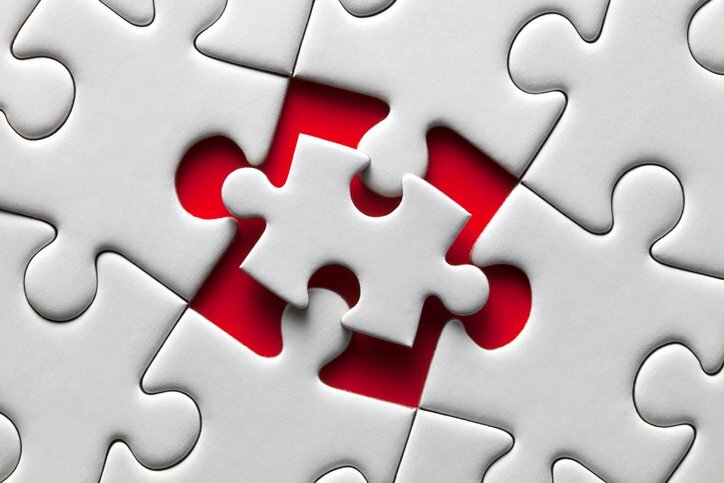 See also, What Makes a Good Retail Sales Training Program? Look retailers, the place is on fire! 75,000 stores will need to close by 2026. I don’t have to go into any store. Products now find us in our Facebook feed; our discretionary dollars are shrinking as they are gobbled up in new ways that don’t involve going to your pretty palace. Many of you are missing the final steps to winning the shoppers’ wallet. Who’s minding your store and engaging the strangers who took time out of their day to give you a shot at their money?